Serving Baltimore, Maryland, Virginia, and Pennsylvania. 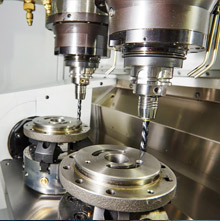 At Southern Saw Service, we know how high the learning curve can be with CNC routers. While most suppliers of CNC routers do a great job teaching the particulars on programming and operating these machines, most of their “teaching” stops there. Now comes the next big learning curve – tool selection and how and why to run particular tools at the feed rates and RPM’s to optimize tool life and and obtain the best edge finish. That’s where the team at Southern Saw Service comes in. When you buy your tooling from Southern Saw Service, you get our decades old experience in tooling up CNC routers. There is a reason Southern Saw Service has won LMT Onsrud’s distributor of the year award for three consecutive years – our commitment to our customers to provide more than the best in CNC tooling. We provide the knowledge to help make your CNC routing experience as pain free and profitable as possible. Southern Saw Service likes to simplify the tool selection process and will specify the right tool for your particular application as well as the proper feed rates and RPM’s for that application. There are many variables (type of machine, material being routed, size of parts etc.) that enter into the “which tool do I use” equation and our dedicated and experienced staff will be more than happy to recommend the right tooling for your particular application. At Southern Saw Service, we have a deep understanding of the hows and whys of CNC routing when it comes to tool selection and the particulars of how to run them. Whether you are new to CNC routing, or have many years of experience, we know the team at Southern Saw Service can help you become more productive. Contact us today to learn how the “Southern Saw Difference” will benefit your business!! Stay sharp with Southern Saw! Call today at 410.327.0050 or 800.468.3798 to get started. You can also email us at info@southernsaw.com.